Home STUDIO All jewelry designs HEADING TO THE COAST…Looking for Tide Jools! HEADING TO THE COAST…Looking for Tide Jools! 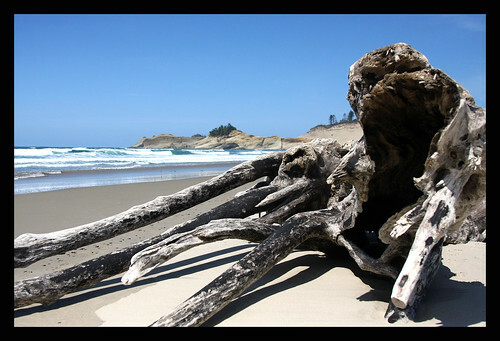 If you had a chance to read the SANDRA MILLER STUDIO AUGUST NEWSLETTER this week you know we are on the road again next week for a trip to our stunning Oregon Coast!! One of my favorite things to do on my beach walks is to look for Beach Glass. With my bad eyes I’m sure I miss most of those little “Meramaids Tears” that I pass by, but the fun is in the hunt. And speaking of my limited vision…..one of lifes rare pleasures is for me to RUN on ta flat sandy beach without my white cane. There is no where else I can think of where I can move faster than a snail’s pace without fear of falling down steps, tripping on curbs, running into people accidentally or missing a pothole…..it is pure bliss for me and I am so looking forward to stretching my legs in the fresh salt air!! 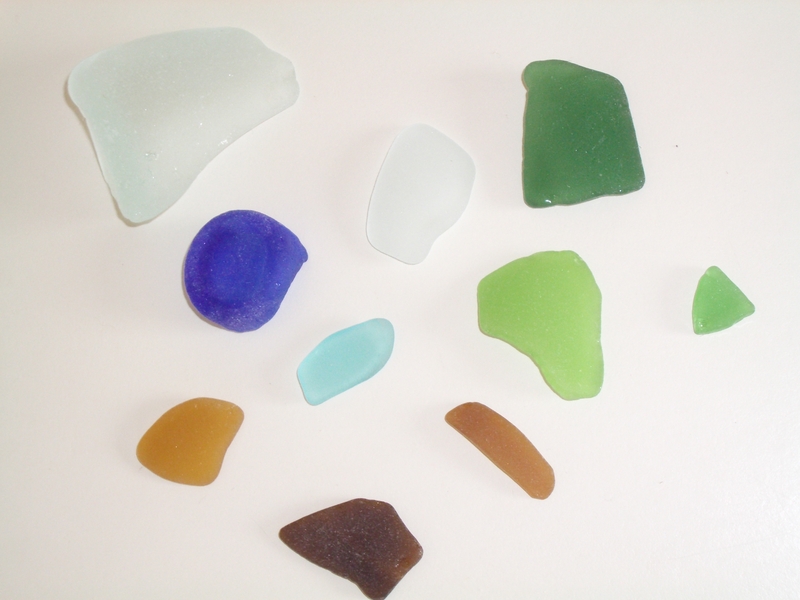 Sea glass (or beach glass) is glass found on beaches along oceans or large lakes that has been tumbled and smoothed by the water and sand, creating small pieces of smooth, frosted glass. Sea glass originates from bottles and jars that enter the water as litter and become broken up by the waves and rocks. Green, clear, brown, and amber beach glass is common (consider the most common colors of beer-bottles), though light blues, yellows and pink varieties have also been known to appear. Much more rare are grey, purple, bright red, and the black varieties. An extremely rare red, sea glass bottle stopper. This probably capped the top of a a perfume vial. Red sea glass is found only once for every 5,000 pieces found, while the rarest of all seaglass, orange, can be found about once every 10,000 pieces. “Black” sea glass is rarely found and often originates from pre-1860 glass that is actually dark olive green. Some black sea glass is found around Australia, originating from 1940s beer bottles. Its rarity is due to the obscure materials that were used with glass to make the bottles, which increased its rate of decomposition. SEE YOU AT THE BEACH!! BRING YOUR SUNSCREEN AND A BOTTLE OF WINE A BATHING SUIT AND A WINTER PARKA AND A SENSE OF HUMOR….THIS IS THE OREGON COAST AFTERALL…LOL! AND I’LL LEAVE YOU WITH A LOVELY VIDEO FROM THE AREA WE WILL BE STAYING IN WHICH I FOUND ON YOUTUBE OF SOMEONE RUNNING THEIR PACK OF BORZOI AND GREYHOUNDS ON THE BEACH. BREATHTAKING IMAGES!! 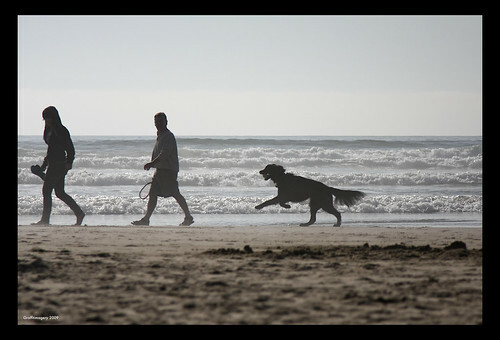 THIS BLOG POST IS DEDICATED TO MY DADDY AND HIS BORZOI PUSHKIN…DAD LOVED THE BEACH SO MUCH!! some friends of mine just came back from Ft Bragg – have you ever heard of this beach? Its covered in beach glass! Which beach are you headed to? I am actually staying home this weekend. Mom & Dad’s 60th Wedding Anniversary is Sunday. Time for a lil family time. My sister is flying out from Florida on Saturday. I haven’t seen her in four years. OOOOH LEAH I’ll have to do some research on that beach!! Thanks for the heads up and I’ll let you know what I find out!! Mary I bet you are goin to have an awesome weekend with your family!!! Say HI for me!! We are heading to the Yaquina Head area. Have a cutie little bungalow that takes dogs there to stay at. I just checked the weather and it looks like SUNNY and low 70’s all week so far!!! Pleeeeeeeeeeease stay that way!!!! Leah I found out about the Ft Bragg beach..they actually nicknamed it “glass beach”. Heres the info!!! Glass Beach is a beautiful, rugged beach west of Fort Bragg, with cliffs and crashing waves. There’s little sand, but nevertheless, Glass Beach is one of California’s most interesting beaches. The Fort Bragg city dump once stood here. It closed in the 1960s, but broken glass remained. Over the years it’s been ground and polished. For many years, a steady stream of visitors collected glass to take home. Finally, before this unique sight was lost forever, the state parks took it over, and removing glass is now prohibited. Are you at the beach?